The sponsors of the Transatlantic Trade and Investment Partnership agreement have been hard at work over the past year to prepare the public for the signing of TTIP next fall. This agreement promises to change the status quo of the global economy, and its consequences will be felt throughout the system of international relations. TTIP is being drafted by the Office of the US Trade Representative and the EU’s European Commission amidst an atmosphere of secrecy that resembles more a backroom deal than a discussion of the principles of free trade. The general public must still make do with either brief and not very illuminating statements from «authorized agencies» or else leaks published in the media. Only in February 2015 were a few crumbs of information about the planned agreement posted on the European Commission’s website. There is possibly no other topic in Europe today that has been the subject of such an intense publicity battle or so completely shrouded in disinformation. More than three years have passed since work began on the TTIP project, and during that time many secrets have been revealed. The following picture emerges. Forty-six percent of the world’s GDP would pass through this transatlantic free-trade zone. Allegedly the future agreement aims at «removing customs duties on goods and restrictions on services, gaining better access to public markets, and making it easier to invest». For the EU, the future agreement will open up the US market for state purchases, while maintaining both the ban on imports of genetically modified organisms (GMOs) and hormone-treated beef, as well as the recognition of geographical indications on foodstuffs. For the United States, TTIP will offer freer access to Europe for American agricultural products, the tariff-free export of motor vehicles, and the preservation of the ban on hiring foreign contractors in many industries, such as shipping. However, this cursory description of the contents of TTIP was upended by a leak from Brussels in March 2014, when Germany’s Die Zeit published seven chapters of the agreement that had been obtained secretly, and which indicate, for example, that Article 14 of the future document contains rules that prohibit governments from engaging in «nationalization or expropriation... except: (a) for a public purpose; (b) under due process of law; (c) in a non-discriminatory manner; and (d) against payment of prompt, adequate and effective compensation». That is an explicit restriction of the economic sovereignty of a nation state. And if the leader of a state still decides to pursue nationalization, Article 14 (2) requires that compensation be paid for «the fair market value... plus interest at a commercial rate». It’s safe to say you don’t want to nationalize. But that’s not all. What are known as «Investor-State dispute settlement provisions» have been drawn up and are intended to further restrict a state’s sphere of competence in the economy. In December 2013, more than 200 environmentalists, trade unionists, and public consumer-protection organizations on both sides of the Atlantic sent a letter to the USTR – Office of the US Trade Representative – and to the European Commission with a demand to eliminate this provision from the trade talks, as it is a «a one-way street by which corporations can challenge government policies, but neither governments nor individuals are granted any comparable rights to hold corporations accountable». Nick Dearden, the director of Global Justice Now, spoke out against the agreement, backed by extensive analytical material. He pointed out that «[a]ll of these agreements are being negotiated secretly, with hundreds of corporate lobbyists given special access to the process. All of them will erode democracy... and enforce corporate power through parallel legal systems that make states accountable to corporations rather than vice versa». Martti Koskenniemi, a professor of international law at the University of Helsinki, has also noted that the plans to include a strategy to protect foreign capital in the agreement jeopardize the sovereignty of states that have signed this agreement and placed their trust in a small circle of lawyers who are sitting in foreign arbitration courts, and it also grants unprecedented power to interpret and revoke the legislative acts of the signatories. No less discriminatory are the regulations governing the nation states’ financial activities. For example, TTIP will limit the right of governments to adopt regulatory laws or to oversee insurance and banking. Dean Baker, the co-director of the Center for Economic and Policy Research (CEPR), claims that «The most important fact to know about the Transatlantic Trade and Investment Partnership (TTIP) is that promoting trade is not really the purpose of the deal... [T]rade barriers... between the United States and European Union (EU) are already low... The deal is about imposing a regulatory structure... that likely would not be approved through the normal political processes in each country. The rules that will be put in place as a result of the deal are likely to be more friendly to corporations and less friendly to the environment and consumers than current rules». The primary beneficiary of the impending transatlantic agreement will be US corporations, which – due to lower costs of production – will be able to launch a massive attack on the newly unprotected EU market and fully subjugate it. In early 2015, Deutsche Wirtschafts Nachrichten published some calculations by the American economist Jeronim Capaldo regarding the consequences of TTIP for the EU. According to his estimates, the agreement will lead to declines in European net exports in the first decade. This will result in a decrease in earned income. France will be the biggest loser, where there will be a drop of 5,500 euros per year per employee, while Northern Europe will suffer a loss of 4,800 euros, the UK – 4,200 euros, and Germany – 3,400 euros. Overall, the EU will forfeit 600,000 jobs and a large number of small farms, while also seeing an increase in its state budget deficits. TTIP’s negative impact on Europe will affect more than just the economy. The influential German journalist Jens Jensen identifies potential casualties in the cultural sector. «Let’s take for example an American filmmaker who enters the European market of subsidized German or French cinema. Under the provisions of TTIP, he could demand the same subsidies that German or French film companies get. Or he could demand that all subsidies be eliminated. That would decimate the very concept of providing sponsorship to the European film industry, which is able to survive and compete with Hollywood only thanks to state assistance. It would be the death of German cinema... The parliaments in every European state have made a decision to promote the development of their national film industry, and these rulings that were made democratically would be scrapped if TTIP is signed». Jensen claims that the same fate would await the theater, symphony orchestras, public television studios and radio stations, and the publishing industry. Even higher education would be threatened with extinction, because TTIP stipulates that public universities may no longer receive money from state coffers. They must become as expensive as private schools. The preparation of the draft agreement has been completed, but the European public is not being allowed to examine it. And the European public is not sitting by silently, but is protesting. The website of the STOP TTIP movement has posted the text of a petition opposing the transatlantic pact, which has already collected more than three million signatures. 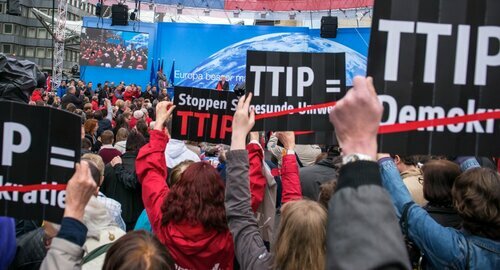 Last year, tens of thousands of people across Europe took to the streets to protest TTIP. Marina Albiol, an MEP from Spain and a member of the United Left party, claims that TTIP is a «hurricane that would sweep away citizens’ rights». The ranks of the protesters are swelling, and EU officials are doing all they can to try to neutralize them. For example, last July the European Commission refused to register STOP TAFTA (another name for TTIP), a European Citizens’ Initiative. In March 2015 the Bundestag concluded a special investigation that determined that councils of German cities and communities have no right to examine the content of TTIP, and if they do so they are breaking the law. But in the meantime, by March 2015, the procedure for drafting TTIP and the content of that agreement had been discussed in 113 urban and local councils in Germany, and everywhere negative resolutions were being published in regard to this issue. In this context, the leaders of Germany’s biggest political parties are acting as though they have been hypnotized. Even the German Social Democrats, who in better days developed the successful «Ostpolitik», are pretending that there is nothing inherently dangerous about TTIP. 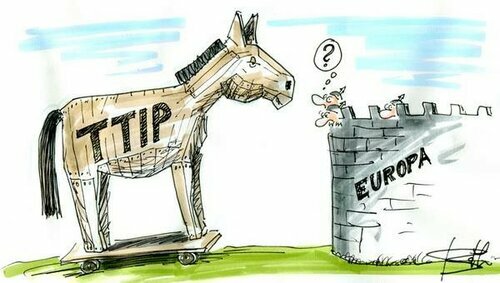 As the chairman of the SPD, Sigmar Gabriel, stated at the recent national party congress, «the SPD accepts TTIP with some reservations». Apparently, the long path traveled by the German Social Democrats, who have had their ups and downs, has now led the party to a position in which they find themselves in the same camp as those who are dismantling the German welfare state. But an increasingly confident voice of protest is being raised in Germany by the «second-tier» parties (the Left and the Greens), trade unions, and public organizations that are not dependent upon multi-national corporations. And they do not see this as a hopeless case. Even if the TTIP agreement is approved in late 2016 by the governments of the EU member states, the next step will be to get it ratified in the parliaments. Presumably that is where the struggle will come to a head, and the results of that will make it clear whether the American bull will succeed in abducting Europa.